Fig. 1. 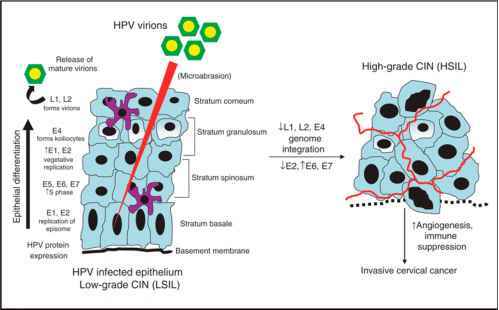 Histological and molecular characteristics of endometrial lesions. The precursor lesions are shown on the left and the invasive tumors on the right. The common molecular genetic alterations found in each morphological entity are shown directly under each photomicograph. SH, simple hyperplasia; CH, complex hyperplasia; CAH, complex atypical hyperplasia; G1, Grade 1 endometrioid carcinoma; G2, Grade 2 endometrioid carcinoma; G3, Grade 3 endometrioid carcinoma; EIC, endometrial intraepithelial carcinoma; USC, papillary form of serous carcinoma; USC glandular, glandular form of serous carcinoma. From ref. 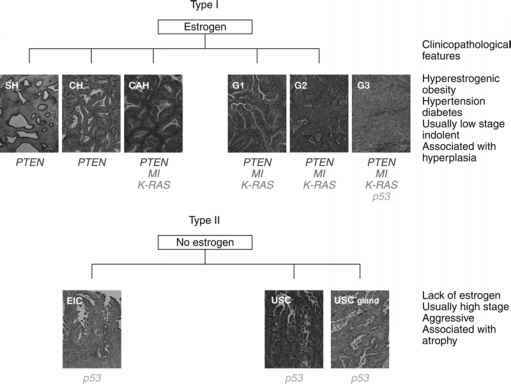 24.
hormones in the context of endometrial carcinoma will be briefly discussed followed by a short introduction of a genetic mouse model of endometrial carcinoma.